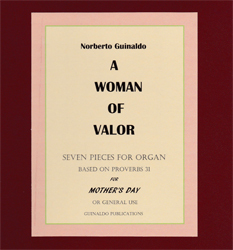 Number five in a set of seven pieces titled A Woman of Valor, "Wisdom and Kindness" is used here as a sample of the compositional style used in this set. Here the melodies are sinuous, undulant, and the harmonies lush and sensual. These pieces are based on Proverbs 31, which extolls the character of an ideal woman: a wife, a mother, a home maker, and a business partner. Each piece has two titles. One points to a particular trait in the life of this exceptional model deduced from the various verses. The other, to the particular form given the piece such as "Pastoral," "Spinning Song," "Homage," etc. In this particular case it is "Arabesque," a fanciful name derived from ornamentation in Arabic architecture reflected in the turns and twists of the melody. The use of double titles frees the music from being tied down to a particular day, thereby providing opportunities to play them whenever the organist wishes. 5) Wisdom and Kindness ("Arabesque"
Most can easily be sight-read, with only two needing some light practice. As if a trait with this composer, the pieces are colorful in themselves, with many opportunities for changes of registration and adaptable to any organ, large or small. Watch and listen to "Wisdom and Kindness" (and any of the other pieces of the set) at the Guinaldo Publications website or on DIAPASON TV.